Above: Remains of 247 properties demolished to make way for the future Henderson Hopkins Partnership Elementary School. In the background, St. Wenceslaus Church. But only one community group has single-handedly confronted the daunting task of representing an entire neighborhood facing elimination by a project developed by the City and its largest employer. Save Middle East Action Committee, better known as SMEAC, was formed in 2001, four months after then-Mayor Martin O’Malley and Johns Hopkins University decided to remove 750 households in 88 acres of the downtrodden Middle East community, just north of Johns Hopkins Hospital in East Baltimore. The plan by the entity they created, East Baltimore Development Inc. [EBDI], promised to lift up East Baltimore through the creation of a new residential neighborhood and a biotech park that would foster jobs, as well as medical breakthroughs by Hopkins researchers. It was also one of the country’s most ambitious efforts to seize private property through eminent domain. But neither the city nor Hopkins invited residents to participate in the decision to demolish the community. In fact, many of them learned about it in The Sun in January 2001. Now comes a book aiming to set the historic record straight about SMEAC’s struggle to represent those forced to leave and to give the low-income, African American residents of Middle East a say in their future: to make sure they received enough money to buy or rent new homes, to ensure the messy demolition did not endanger their health and to find a way to let some stay in the newly built community. Race, Class, Power and Organizing in East Baltimore: Rebuilding Abandoned Communities in America, by Marisela B. Gomez, is both a textbook tale of a David-and-Goliath neighborhood organizing battle and the author’s unabashed pro-community view of the long, difficult history between Middle East and its powerful, ever expanding neighbor to the south, the Johns Hopkins Medical Institutions. She also comes with a personal story of her own involvement in the Middle East controversy as a Hopkins-educated medical doctor with a PhD in immunopharmacology and a masters degree in public health. While at Hopkins, Gomez began volunteering in Middle East, attending meetings of anxious residents about to lose their homes. She became so passionate about their cause that she took the job as executive director of SMEAC in 2003. “It is my aspiration to offer a perspective from ‘inside’ the community: one that is seldom recorded in detail,” she wrote in her introduction. 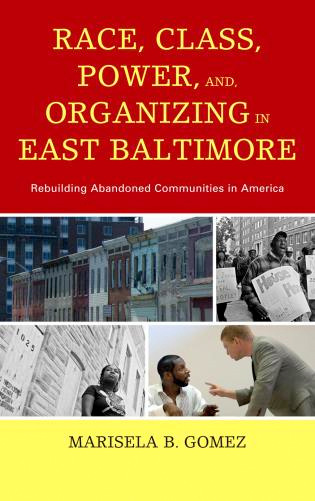 While SMEAC was unable to save any homes in Middle East from being seized by the city and East Baltimore Development Inc. (the nonprofit formed by the city and Hopkins), Gomez’ book does describe SMEAC’s efforts to bring some social justice to displaced residents. Her book documents, for example, how the city initially was only willing to give residents small sums of money to move (at first only $22,500 per household in 2001) that would never allow homeowners to afford houses in new communities. Thanks to SMEAC and its many protests, each Middle East homeowner received relocation packages of as much as $250,000 so they could buy houses elsewhere at the height of the housing bubble. These facts are important in countering numerous assertions by the project’s leaders and funders in recent years that the generous relocation package, setting a new standard for compensating people relocated through eminent domain, sprang from their own high moral standards. But that’s not how it happened, as Gomez’s book recounts. Months of community organizing, public protests (“Real Justice for Real People” read one sign carried in a protest in front of Hopkins hospital) and letter writing campaigns (often with the help of Morgan State University professors) led to raising the standards for those forced to leave. Their demonstrations paid off, whether it was for more money for relocation, better health standards for curbing air pollution (including lead dust) during demolition, or a chance for some residents to stay in the community by getting newly renovated homes in Middle East. This was true until last November when two EBDI officials appeared on the Marc Steiner show on WEAA (88.9FM) and praised Gomez and other community leaders who have been a thorn in their sides for years. Douglas Nelson, EBDI board chairman who recently retired as CEO of the Casey Foundation, which has invested more than $36 million in the project, and Christopher Shea, EBDI’s president and CEO, appeared unusually conciliatory toward community adversaries. At one point Nelson confessed that he wished EBDI had listened earlier to SMEAC’s pleas to set aside numerous vacated houses to be renovated for Middle East residents who wanted to stay in the community. Known today as the “House for House” program, there are only about 40 such houses, out of almost 1,400 houses that have either been demolished or are awaiting demolition. Shea gave unusual credit to the “genius of the community” for suggesting more options for residents who didn’t want to leave. What prompted these leaders’ change of tone is unclear. Perhaps it was only coincidental that their conciliatory comments came just as Gomez’s book was being released. In the photo, former EBDI director Jack Shannon stands, wagging his finger in the face of SMEAC’s president Donald Gresham, who is seated. What were they arguing about? The book doesn’t say, but I asked Gresham if he remembered. They were disagreeing, he said, about the very “house for house” plan that Nelson now praises. But at the time, SMEAC’s proposal to set aside houses in the community for those who wanted to stay was met with fierce resistance from EBDI. Gresham was one of the few Middle East residents who stayed in the community and received a newly renovated house last year. He lives on the 1100 block of McDonogh Street in the project’s northwest corner. But his new neighborhood is not what he expected. His home is only one of three occupied in the block of 15 vacant houses and two vacant lots. Many of the houses across the street are collapsing in the back. EBDI has announced no plans to rebuild the rest of the block, which has been vacant for several years. “We haven’t been told anything,” he said. This is indicative of the entire EBDI project today: large grassy lots stand where new homes and biotech buildings were once planned. In addition to the large lots, there are nearly 600 derelict vacant houses that were slated for demolition years ago. Most abut a seven-acre public school being built by Hopkins. The development plans are so far delayed that many of the properties are still in the hands of private landlords and the city, instead of EBDI, according to property tax records. A city housing spokeswoman recently told The Daily Record that 172 vacant houses will be razed this year, but no plans have been announced for the remainder of the buildings. The building going on is mostly centered on Johns Hopkins, with one biotech building (out of five originally planned) and a Hopkins graduate student tower with an adjacent parking garage. The Maryland Department of Health and Mental Hygiene is building a new lab (which will not generate property taxes) where a private biotech building was scrapped. So far, more than $220 million in government funds have been committed to the project, according to my count of city, state and federal funding sources. A new master plan – the project’s third – is being scrutinized in City Hall to scale back the size of development that would include a six-acre park with an exercise circuit where Middle East residents once lived. 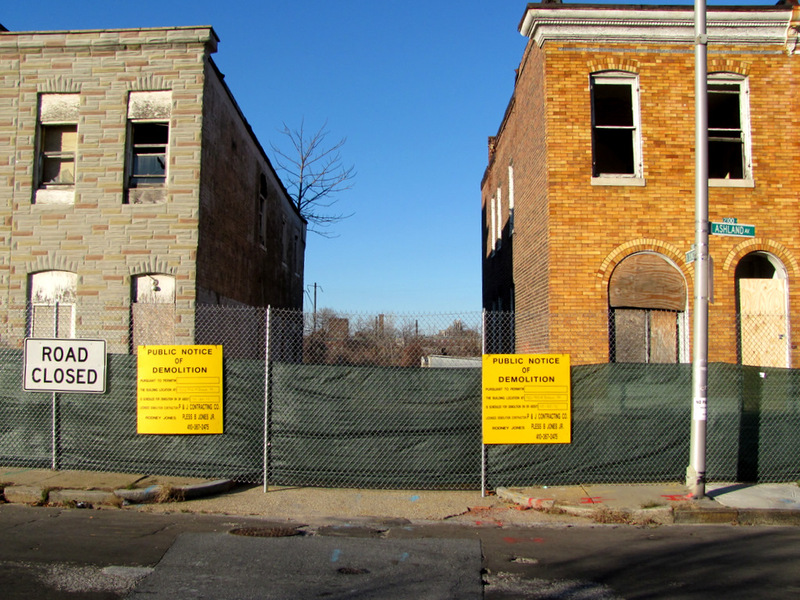 And although there have been negotiations with builders for new homes, no construction has begun, except for a few scattered rowhouses being renovated. Gomez’s book is full of little-known facts that round out this sad story of the project’s many delays due to the recession and difficulty luring builders to such a derelict part of the city. In 2002, she says, a biotech incubator board was appointed to look for companies that might want to move to the new biotech park. “This board’s responsibility was to develop a focused business plan during the first 7 years of the project,” she writes. But the board never met. Though the book doesn’t mention it, Gomez said in an interview that she was one of the appointed members of the board that was to be overseen by City Council members Bernard “Jack” Young and Paula Johnson Branch, who represented Middle East at the time. While bringing such small details to life, she also puts the story in a historic context, one that shows Hopkins repeatedly expanding in East Baltimore over the last century, encroaching on surrounding neighborhoods and making low-income African American residents wary as Hopkins bought up slum properties and contributed to the community’s neglect. This has been well documented outside her book. In 1982, I wrote in the Evening Sun that the university and hospital’s endowment fund owned 164 dirt lots, commercial buildings and rowhouses adjacent to the hospital, some with housing code violations. 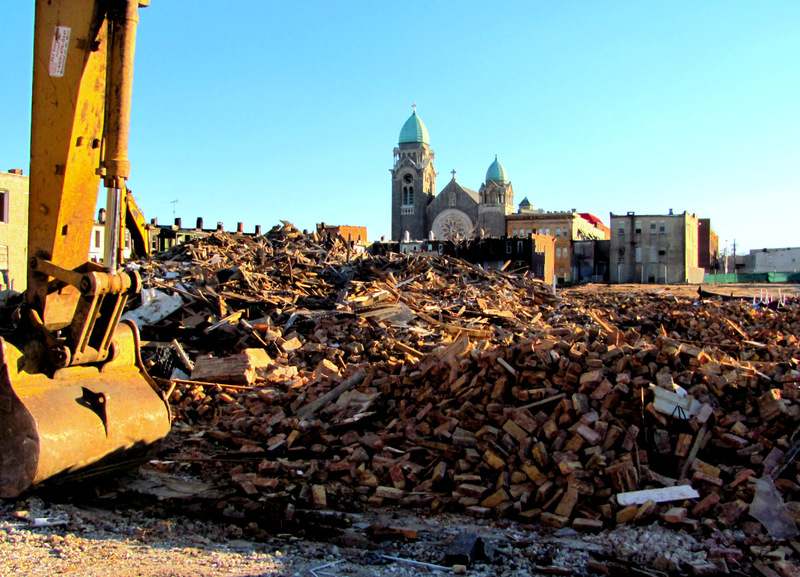 Today Hopkins owns 31 vacant lots, unpaved parking lots and vacant houses in the unfinished EBDI project, according to state property tax records. One glaring example in the book of how Hopkins’ expansion affected the community is a photograph from the 1950s of several square blocks of cleared land just west of Broadway (which involved the forced relocation of 1,000 families). The photo eerily resembles today’s pictures of several square blocks of vacant land where Middle East residents once lived. Like the current plans for a new community the Broadway redevelopment project of the 1950s, was delayed as the land sat vacant for years. There are some peculiarities in the way Gomez assembled the book. She purposely eliminates many names of people who readers might view as heroes or villains. The letters she reprints between EBDI and SMEAC, for example, have deleted names. “The book needs to be about roles, not personalities,” she says. Another problematic feature is the book’s price. It is being marketed by publisher Lexington Books (an imprint of Roman & Littlefield) as a sociology textbook. That explains why it has an $80 pricetag, an embarrassment to Gomez who is raising money to give a book to each displaced resident of the project. For anyone who wants to read the introduction and first three chapters for free, go to her website at www.mariselabgomez.com. – A reporter for 28 years with the Baltimore Sun and Evening Sun who covered housing, development and other issues, Joan Jacobson co-authored, with reporter Melody Simmons, a five-part series on the EBDI project that ran in The Maryland Daily Record in 2011.